I want to follow-up on my earlier post about the new Fire on the Mountain location on NE 57th and Freemont. The place has been open for about a month and they are now pouring several beers produced in-house. You can jet back to my earlier piece here if you wish. 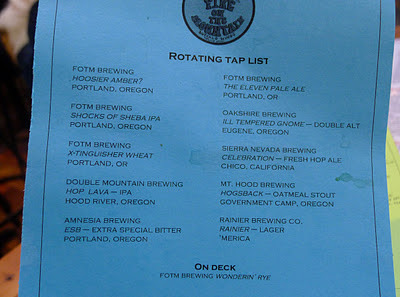 A quick review: the FOTM brewing facility was put together with assistance from Craig Nicholls, well-known in the local beer community via his time at Alameda, Roots and as organizer of the North American Organic Beer Festival. Ben Nehrling was hired to run the brewing operation. Nehrling previously worked at McMenamin's Kennedy School. Enough said. I tripped on up the FOTM the other day, eager to check out the brews. The place has been packed to the gills for much of its first month. Knowing that, I got there in the late afternoon just in time to find a spot in the bar area. Tasters up! Another quick preface: FOTM previously announced they would be offering 4-5 house beers to go with what has historically been a strong guest selection. 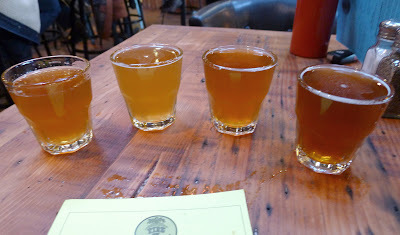 Besides the four beers I tasted, they expect to release Wonderin' Rye this week. I'm told they also have a stout and a lager waiting in the wings. Moving right along, there is nothing earth shattering here. The four taster beers are all very clean and pleasantly unoffensive. They have very little bold character. The Eleven (brewed on 11/11/11) is a very drinkable pale. X-tinguisher Wheat has a nice citrus character courtesy of the Sorachi Ace hops. Shocks of Sheba IPA (inspired by KBOO's reggae program) is an organic IPA with middling character. Hoosier Amber has nice layers of malt and a smooth finish. It would be easy to pan these beers as completely inadequate. But hold on. Step back and consider the big picture here. Fire on the Mountain is mostly about food. And they serve up a lot of spicy food. They are best known for their wings, which are served with a variety of mostly hot sauces. Spicy is the name of the game here. After I tasted of the four beers and made brief notes, I suggested to myself that the beers were perhaps designed to go with the food. Luckily, I had some hot wings on the way to verify that thought. Sure enough, the beers, particularly the pale and the wheat, went well with the spicy wings. We serve a lot of spicy food so I am trying to brew some ales and lagers that help cut the heat and refresh your palate. In terms of viewing the recipes as starting points, we have only brewed ten batches of beer so we had to start somewhere. There you have it. If you're headed out to any of the FOTM locations for a beer, the IPA and the amber offer the most character. Or you can choose from one of the many guest beers. 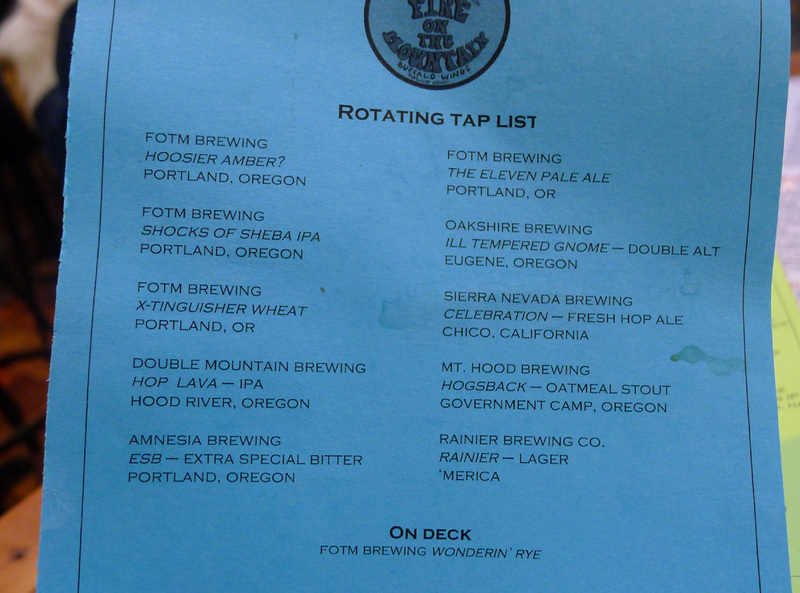 On my trip the guest taps were staffed by Oakshire, Double Mountain, Amnesia, Sierra Nevada and Mt. Hood Brewing. Plenty of high octane beer power if that's what you're after. Did I mention they also have Rainier? My final thoughts are these: I suspect the FOTM beers will evolve with time and eventually have more character than these opening salvos. But I don't expect these beers to compete with the big players in the styles. If they're going make an award winning beer, it will probably be a pale or wheat beer. That could happen. When you drink these beers, keep in mind what they're all about.